Streetcar service started in 1859 with horse-drawn cars. 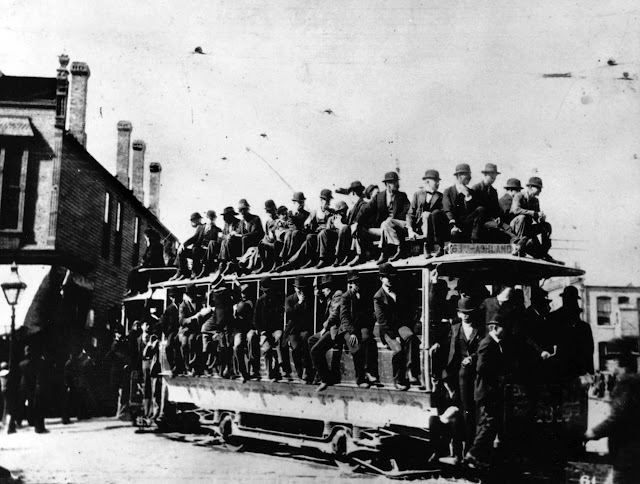 The first cable car in Chicago ran on State Street at 2:30 pm on January 28, 1882 with the last cable car arriving at a powerhouse at 21st Street on October 21, 1906. Cable cars were being replaced by electric-powered trolleys starting in 1890. 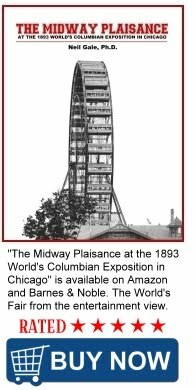 Due to the huge investment in cable car systems and opposition to overhead electrical wires, however, Chicago clung tenaciously to its increasingly derided cable cars until 1906, nearly a quarter century after opening its inaugural line. By the mid-1930s, 3,742 streetcars were running on tracks laid along 529 miles of streets in a grid that provided Chicagoans a streetcar stop within a few blocks of where they lived, worked or shopped. 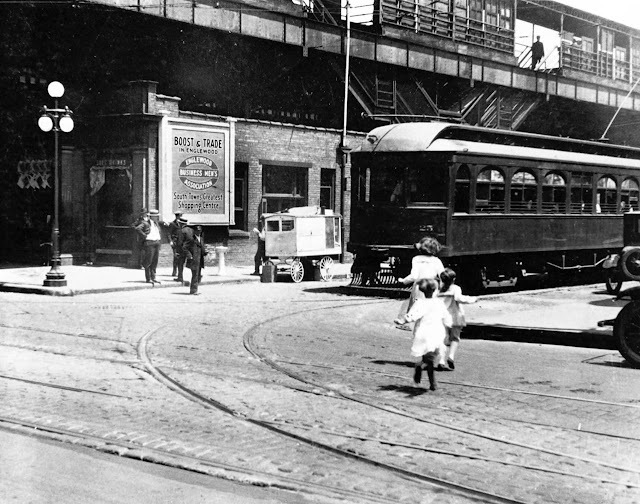 When trolleys traveled the city’s streets, Chicagoans looked down the tracks with a mix of emotions: frustration on cold nights when it seemed a streetcar would never come; anticipation of a jostling ride in a crush of strap holders; anger at the streetcar company which, having greased politicians’ palms, wasn’t concerned with riders’ comfort. 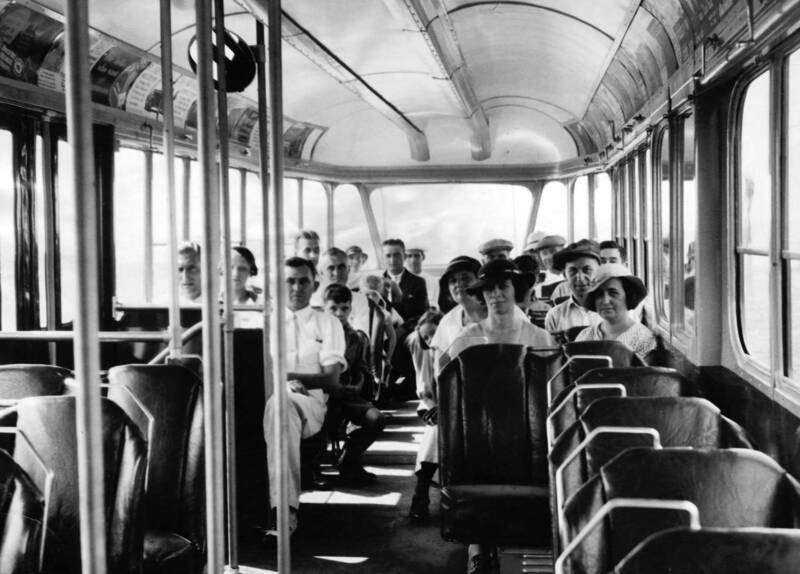 But when the final trolley ran on the last route in 1958, those feelings dissolved into a golden afterglow of nostalgia. 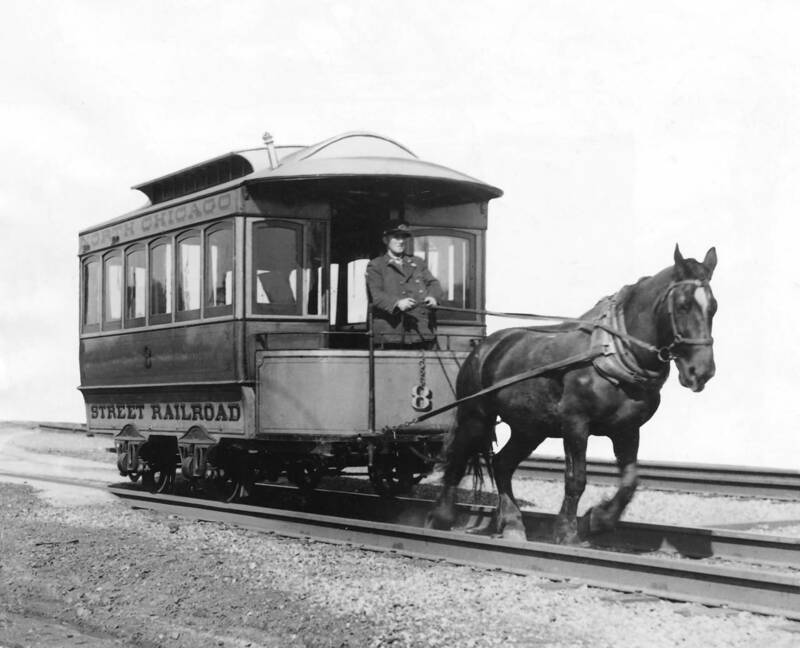 Chicago's first one-horse drawn streetcar ran along State Street from Randolph Street to 12th Street in 1859. The car was called a "Bobtail", having no rear platform. A horse-drawn streetcar operated by the North Chicago City Railway Co., circa 1870-1875. A horse-drawn streetcar at Grand Avenue and Leavitt Street, circa 1886. 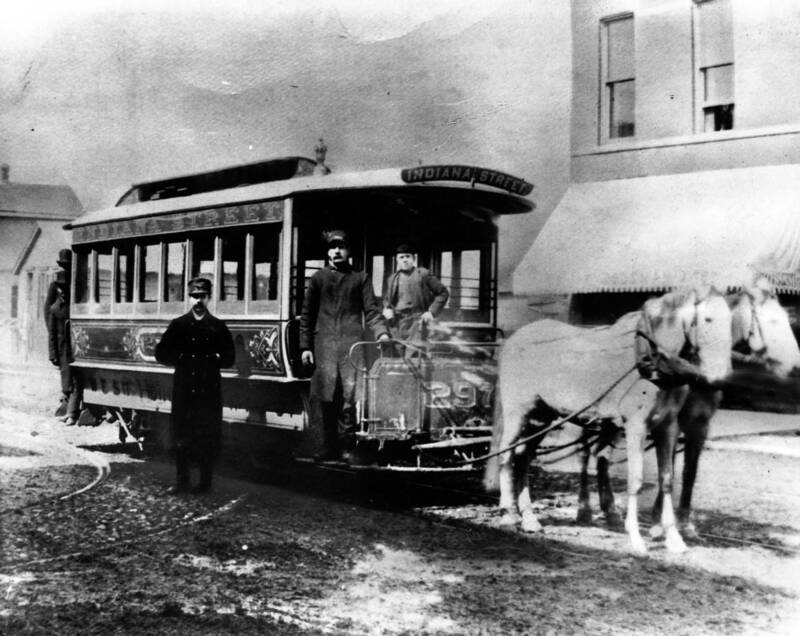 An 1892 Chicago cable streetcar, which replaced horse-drawn cars, was powered by a cable running underground between the tracks. 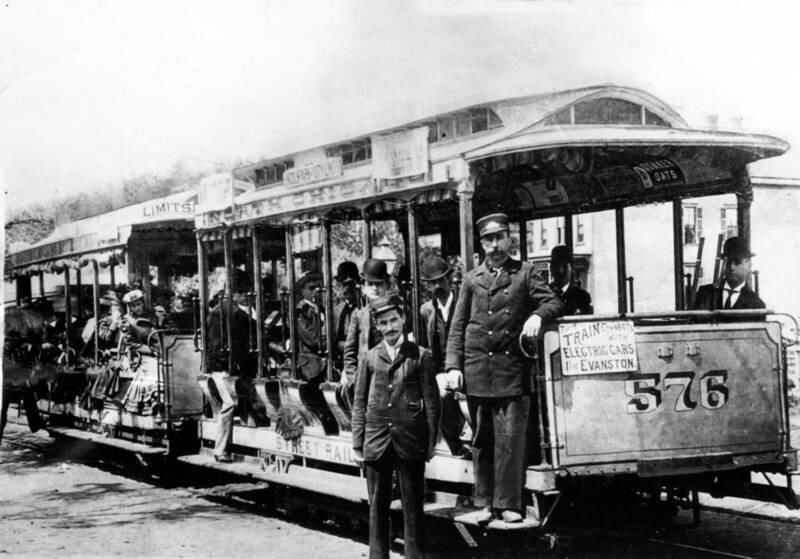 The car and its conductors are at Wells and Clark Streets. 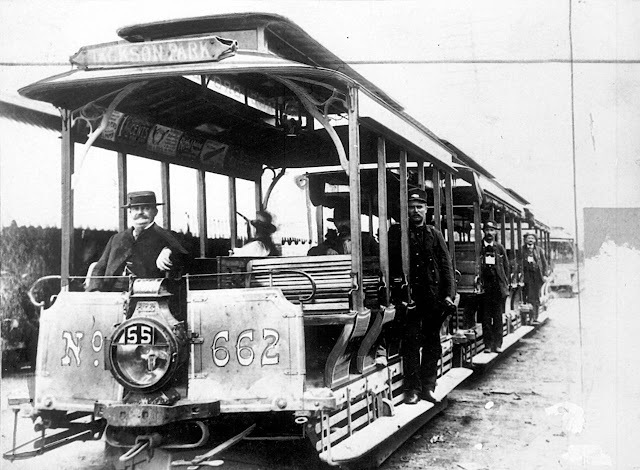 One of the first electric trolleys installed on 61st Street and used during the World's Columbian Exposition in Chicago in 1893. 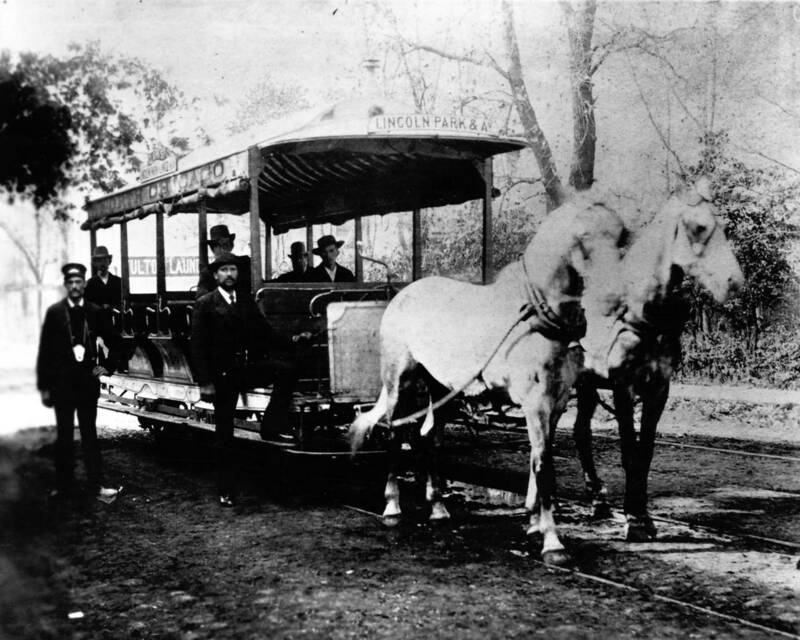 Chicago Jackson Park cable car. No date. 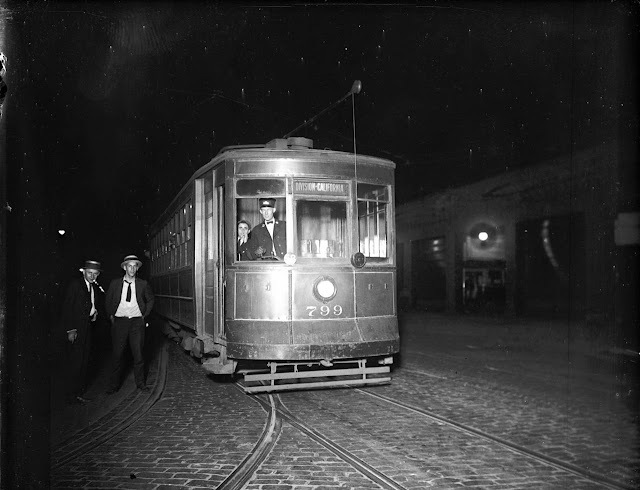 The last streetcar in the barn during a streetcar strike, August 3, 1922. 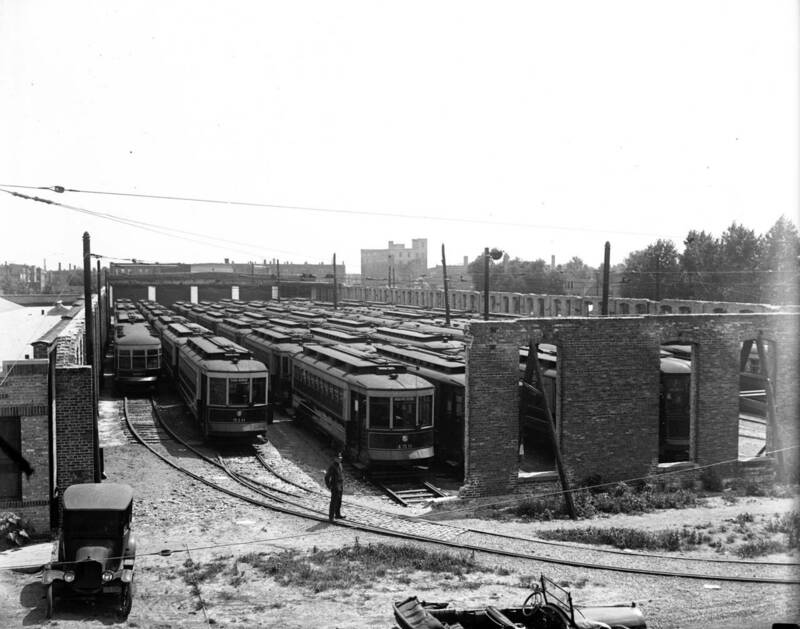 Streetcars parked in the Howard Avenue open air barns, August 3, 1922, during a streetcar strike. Parked streetcars during a strike, August 1922. 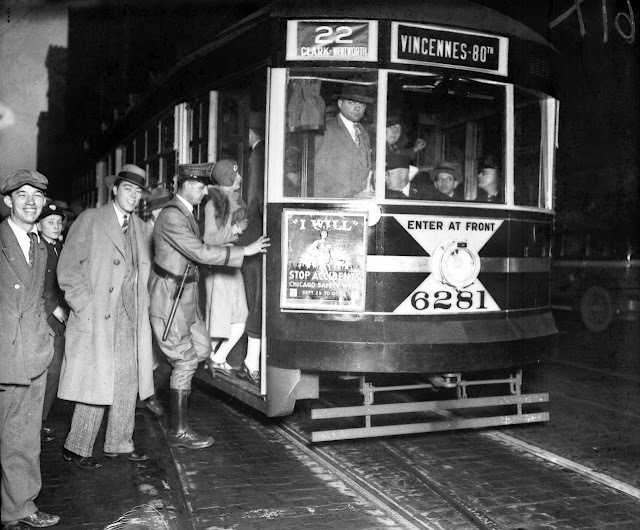 New streetcar, October 3, 1929. The interior of a newly designed Chicago streetcar in 1934 shows more seats for passengers. 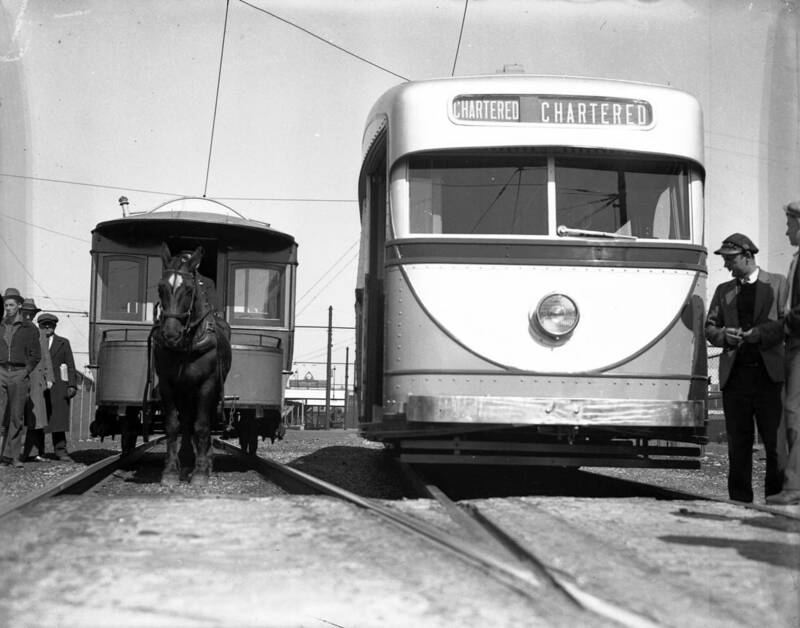 The new streetcar, on the right, and the old fashioned, horse-drawn street car on the left, April 23, 1934. 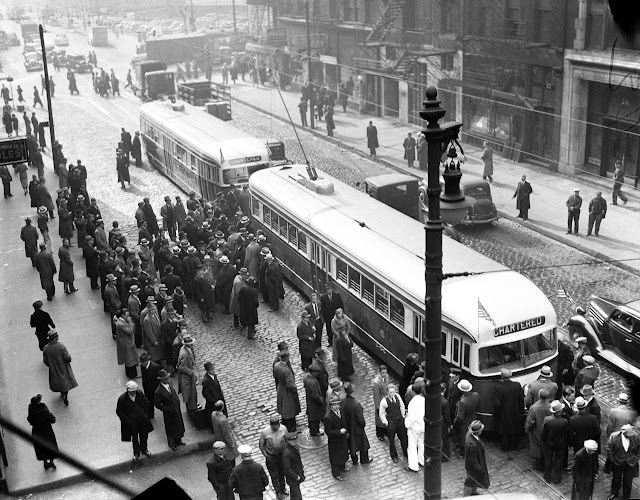 New Chicago streetcars, November 14, 1936. 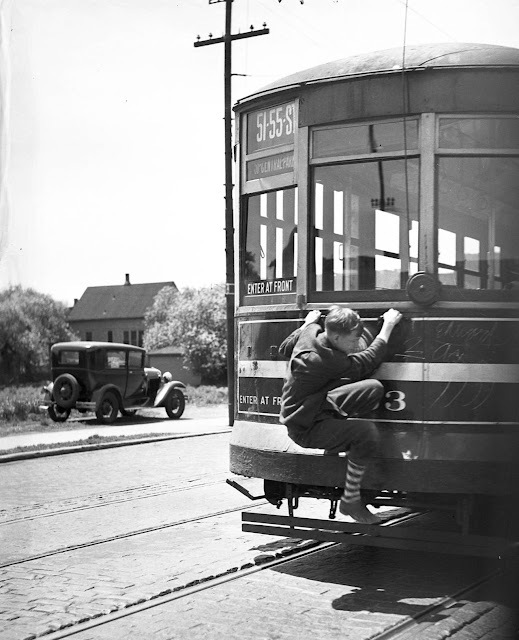 A boy hops a ride on a streetcar on 51st Street near Western Avenue. The photo was taken from the window of a passing auto on June 6, 1937. 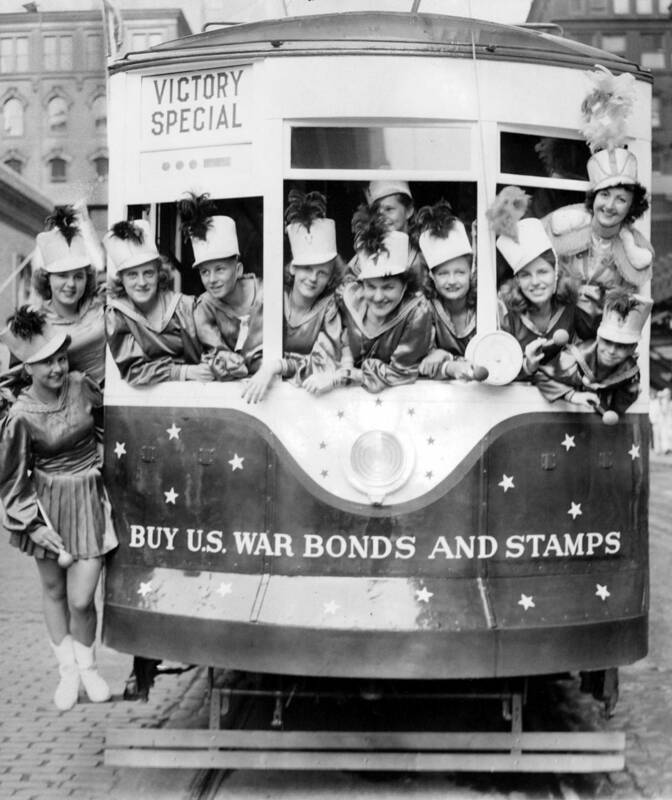 Majorettes help sell war bonds and stamps in a streetcar painted red, white, and blue during World War II. 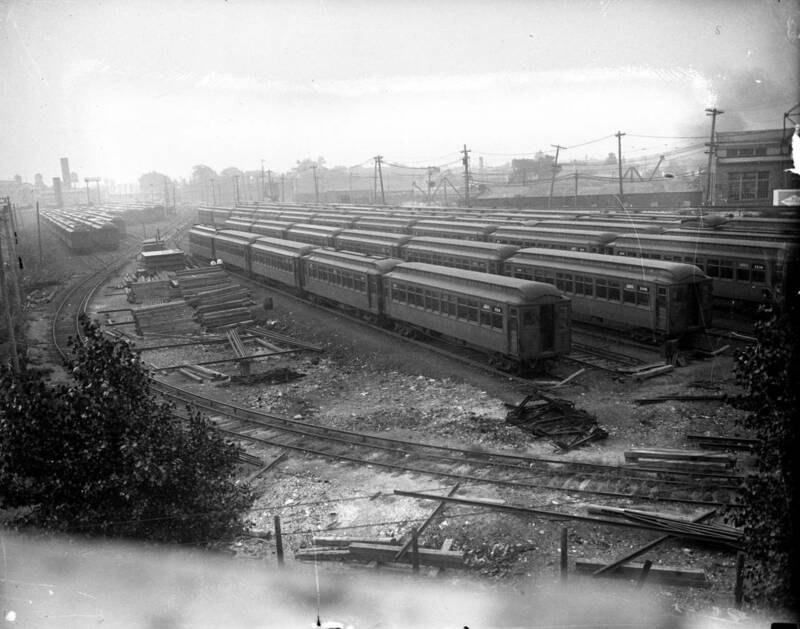 The car went into regular service on the Broadway line in July of 1942. 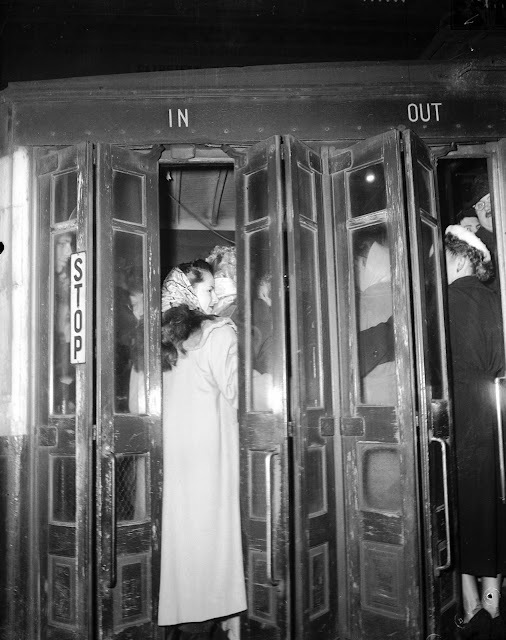 The rear platform of the Milwaukee Avenue streetcar is so crowded at North Avenue that women are stuck in the door as the conductor tries to close it on January 20, 1950. 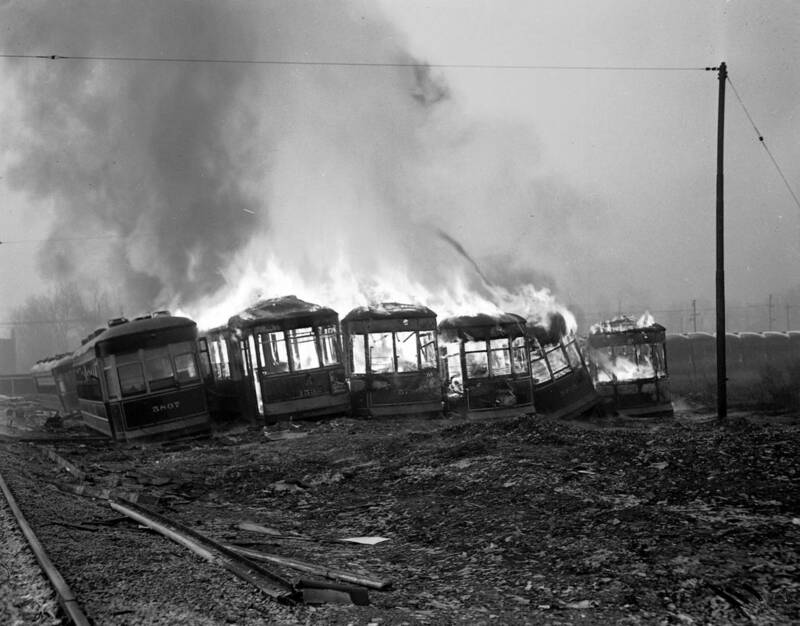 The CTA burned old streetcars on their property at 78th Street and Vincennes Avenue on Jan. 14, 1949. Some of the streetcars were 40 years old.